With a medical degree, two master’s degrees and a graduate certificate, Ahmad Firas Khalid still wasn’t full. When he decided to go for his PhD, he applied to Harvard, Oxford and Cambridge. His mother suggested that he also consider studying in Canada, so he applied to McMaster and the University of Ottawa. He was accepted to all of them. Throughout the application process, one name kept coming up: John Lavis, Canada Research Chair in Evidence-Informed Health Systems at McMaster. Khalid’s long-time mentor recommended Lavis, and Khalid was impressed by the amount of time Lavis invested in speaking with him when he was researching the different institutions. The choice was clear — come to Mac. 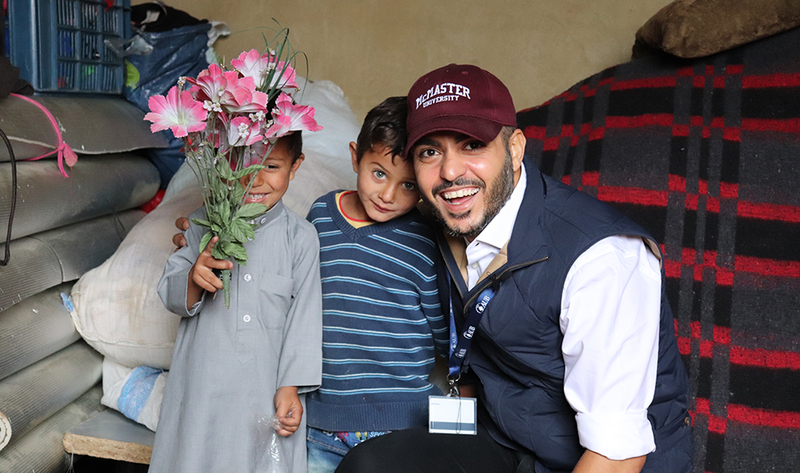 For his PhD, Khalid is researching knowledge translation in crisis zones — exploring ways to bring health evidence into the hands of those making decisions in crisis zones, where time is of the essence. Khalid is also a two-time McMaster Queen Elizabeth Scholarship recipient. Scholars help strengthen health systems and become part of a large network of health-system leaders. A network, Khalid says, he’ll have for life. Khalid already knows the value of that kind of network, thanks to his prior experiences working with Médecins Sans Frontières/Doctors Without Borders in Abu Dhabi and with the World Health Organization in Geneva. In November 2018 he spent three months in Lebanon with the American University of Beirut. While there, he examined the Lebanese government’s role in responding to the Syrian refugee crisis. As part of that experience, he travelled to a refugee camp by the Syrian border to observe the living conditions. While Hamilton’s population is around 500,000, there are three times that number of refugees at the Lebanon-Syria border, Khalid says. It’s a challenge to address the health issues of both the host community and the vulnerable populations, without establishing two separate health-care systems. Khalid believes complex problems can be solved with simple and practical solutions. This is a concept he applies to his learnings, in academia and in life. He credits John Lavis for his ability to push his students towards their potential. “It takes a village,” Khalid says when it comes to taking credit for his many accomplishments. He points to his mother and late father, his three older sisters, his younger brother, his mentors, friends and colleagues as sources of inspiration. This year, Khalid will defend his doctoral thesis. From there, he plans to continue to have an impact. In any capacity. “Do something you love,” his late father told him, and the words echo in Khalid’s thoughts when he considers his next step.